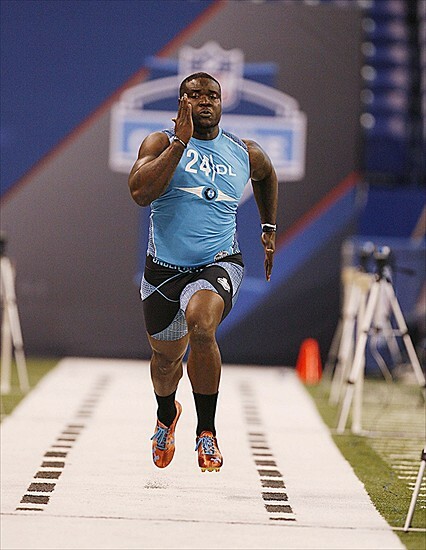 If you are one of those guys who can’t get enough of watching grown men get their mug shots taken in their underwear and watching 350 pound linemen run the 40 yard dash, the NFL Combine is your cup of tea. The fun begins Saturday, February 23 and will run for four days with 10 hours of live coverage starting at 9 AM each day on the NFL Network. You can check out a three hour condensed version of the coverage later each night at 8 PM and midnight. For you Ravens fans, here is a comprehensive list of the names found in many mock drafts accross the web. Some guys to pay closer attention to during the combine as one of them could be wearing purple and black this year. You could skip the 24th if you want. Although the skill players are probably the most fun to watch out of the bunch. Find that fantasy sleeper pick or something. A few quick notes here, and I’ll give an in-depth look at the guys on the Ravens radar after the combine. So much can happen at the combine that none of these guys could be on the Ravens shopping list afterwards. So real quick, It’s interesting to see two strong safties in Vaccarro and Swearinger when it’s Ed Reed, the free safety who may need to be replaced. Looks like if thats the case, Ed Reed could be replaced by Eric Reid. Kind of creepy. In a related story, the Ravens are also scouting Rae Louis. Manti Te’o and Sam Montgomery seem to be poupular picks at three analysts each. Te’o would bring the media circus down from New York to Baltimore. Montgomery could be a solid pick if Paul Kruger doesn’t return. John Jenkins is a big fellow. His stregths list is immaculate. Can’t move him, scheme versatility, good feet, strong as I don’t know what… but his major weakness is that he doesn’t have a good motor, have to sub him out often. No thank you. I don’t want a guy who would be useless in the fourth quarter. Of the two O-linemen, Fluker is a right tackle, and no where have I read that he has the ability to play left tackle. Moving Oher back to left tackle can’t be an option anymore, right? If McKinney re-signs this would give Oher competition on the right side. Barrett Jones on the other hand has won three National Titles. One as a tackle, one as a guard, and one as a center. Nick Saban compared him to Bruce Matthews because he plays all five places on the line extremely well. No way this guy falls to 32 though. You can find a little more in-depth look at Kevin Minter and Jesse Williams here. Again, look for more posts like this one after the combine when we can really see who’s on the Ravens radar.